First, we need one kind of sugar, glucose, just to live. “Glucose is the number one food for the brain, and it’s an extremely important source of fuel throughout the body,” Dr. Kristina Rother, an NIH pediatrician and expert on sweeteners, told the NIH newsletter “NIH News in Health.” But that doesn’t mean you can indulge your taste for sweets; in fact, your body makes enough glucose by breaking down carbohydrates and proteins and fats. And there’s also naturally occurring sugar, which is found in fruits, vegetables and milk, the NIH says. The problem is, Rother told the NIH newsletter, that the sugar in our diet isn’t confined to those foods. “It’s now in just about every food we eat,” she said. 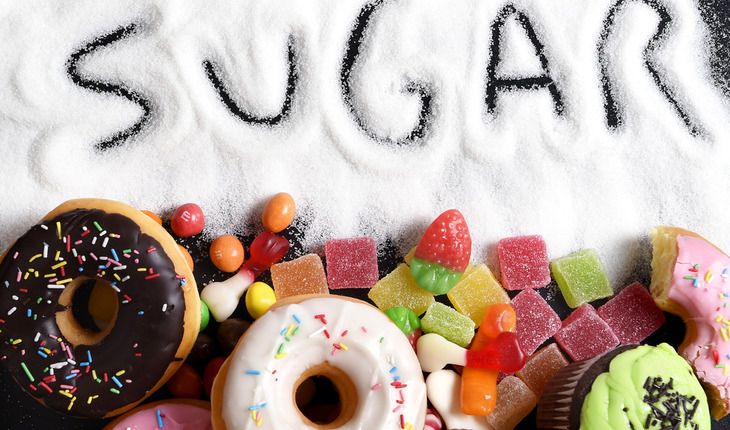 A good portion of that sugar is added during the food manufacturing process. The specific figures are shocking: According to the NIH, the added sugar each American consumes every day adds up to 22 teaspoons. The most common source, the NIH says, is highly sugared beverages such as soda and energy drinks and sports drinks. Sugar is added even to fruit juices, which naturally have a lot of sugar already. Steady consumption of sugar can have serious health repercussions; research has found a link between too much sugar and obesity, as well as heart disease. Although it might seem simple (though not easy!) to cut back on sugar just by looking at a list of ingredients, sugar often has a number of names. These include sucrose (table sugar), corn sweetener, high-fructose corn syrup, fruit-juice concentrates, nectars, raw sugar, malt syrup, maple syrup, fructose sweeteners, liquid fructose, honey, molasses and anhydrous dextrose. Beware of words that end in “ose,” the chemical suffix for sugars. The higher the sugar is on the ingredient list, the more of it there is. The total amount of sugar is listed under “Total Carbohydrates” on the Nutrition Facts label, the NIH says. Millions of people try to reduce their sugar consumption by switching from sugary food and drinks to those that contain low calorie (or even no calorie) sweeteners. The safety of artificial sweeteners has been a longtime subject of controversy. But, the NIH says, researchers have found no clear evidence that sweeteners approved in the U.S. are linked to serious health problems. As for whether these sweeteners can help with weight loss, the evidence isn’t clear. There are some studies, the NIH says, that indicate diet drinks can help you drop weight in the short term. But the weight tends to come back eventually, the research has found. Some investigators also suggest that artificial sweeteners can have a negative effect on microbes that help us digest food, and that process may ultimately aid in weight gain. A lot of research remains to be done in that area. One researcher, Dr. Ivan de Araujo, of Yale University, has been studying with others the possible effects sugars and sweeteners might have on the brain. De Araujo and his colleagues found that sugar and sweeteners both tape into the brain’s “reward circuitry,” but that sugars are more powerful. Get tips on healthy eating and weight control at http://win.niddk.nih.gov.